Xbox One is a pretty good game console which has a slightly better roster of exclusive games going into 2015 compared to that of the PS4. Meanwhile, it’s also a clever and powerful media player. You can pin movies, music, and more for instant access, so that the things you love most are right where you want them. Do you have compatibility problems with your Microsoft Xbox One? 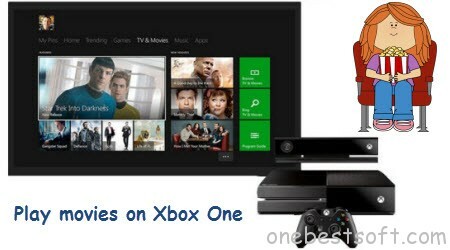 If yes, you are in the right place to find solutions for all questions about Xbox One. Xbox One is a home video game console developed and marketed by Microsoft. Announced on May 21, 2013, it is the successor to the Xbox 360 and is the third console in the Xbox family. The new gaming functionality include an expaned Xbox Live service, enhanced Kinect functionality, cloud computing, the ability to record and share video highlights from gameplay, and support for live streaming gameplay online. 1. Possible to play DVD Discs on Xbox One? Q: Hi, This is possible to play DVD films purchase on Amazon on an Xbox One steaming from a Windows 7 PC? A: Back up DVD to Xbox One digital video formats and stream the copied video to Xbox One. Read the solution here. 2. Does the Xbox One support my 2D/3D Blu-ray? Q: I have a lot of Blu-ray movies in 2D and 3D. How do I transfer these 2D/3D Blu-ray contents to my Xbox One for watching? Does the Xbox One support my 2D/3D Blu-ray? A: Usually, there’s a limitation to play 2D/3D Blu-ray on Xbox One because of Blu-ray protection. If you want to stream and watch 2D/3D Blu-ray through Xbox One, you are suggested to digitize blu-ray firstly. Q: I backed up some ISO movies from Blu-ray and spent a whole day on streaming ISO movies to Xbox One, but in vain? Xbox One won’t read my ISO from USB? How to do? A: You are not allowed to put ISO files to Xbox One for playback from USB. Anyway, you’d better to rip ISO to videos for Xbox One streaming with an ISO Converter first. 4. Can I watch video on Xbox One from a flash drive? Q: I have a latest Xbox One and downloaded four movies online recently that I want to play on my Samsung Samrt TV. When I put TV shows and movies on it, my Xbox One won’t play them. Is there any way to watch movies on my Xbox using the flash drive and keeping good quality? A: If the video is not encoded with Xbox One compatible codec, we will fail to transfer your videos to Xbox One or cannot play them on Xbox One even if successfully transferred to Xbox One. In this situation, there is no other ways but to convert video like MKV, 4K video, Gopro video, YouTube video to Xbox One supported MP4 for successfully playback. 5. Is there a way to get iTunes on Xbox One? Q: Is there a way to transfer iTunes .m4v videos to Xbox One hard drive? If so, how do you do put them on the hard drive? A: Well, that’s because purchased iTunes M4V video files are locked by Apple’s FairPlay DRM protection and can’t play on non-Apple products. If you want to copy and transfer iTunes M4V videos to Xbox One, you should passby the annoying DRM restriction to convert iTunes Movies to Xbox One for streaming. As it officially claimed, Xbox One supports a wide variety of video content. However, the compatible media files are still quite limited. Now check out all the supported formats using the list below. Which is the best tool to convert Blu-ray, DVD, video and edit them before copying to Xbox One? 1. Top Blu-ray Ripper: For people who want to transfer Blu-ray movies to Xbox One, you may need to roll off disc protection, choose target video format and adjust the best video size/bitrate/frame rate for Xbox One. 2. Top DVD Ripper: You cannot miss a DVD to Xbox One Converter if you want to move DVD to your Xbox One. 3. Top Ultimate Video Converter: Need an excellent all-in-one solution to convert any media files, including rental or purchased Blu-ray, DVD, HD videos from Camcorders, all standard videos, online YouTube videos, TV shows, movies downloads etc for playing on Xbox One? All these can be solved with an easy-to-use video and audio converter. 4. Top DRM Removal: We can’t sync iTunes purchased or rented TV shows to Xbox One because of the Apple’s Fairplay DRM protection unless we have a DRM converting tool to strip the iTunes DRM protection, and then do an iTunes m4v to Xbox One compatible formats recording without quality loss.